New York (AP) — After an exhausting summer buffet of set pieces, superheroes and whatever s-word you might use for “Suicide Squad,” the gentle “Pete’s Dragon” is a welcome palate cleanser. Where other summer movies are chest-thumping, it’s quiet; where others are brashly cynical, it’s sweetly sincere; where others are lacking in giant cuddly dragons, “Pete’s Dragon” has one. Few may remember the 1977 Disney original, in which a young boy’s best friend was a bubbly dragon invisible to others. As part of Disney’s continuing effort to remake its animated classics in live-action, “Pete’s Dragon” has been confidently reborn as an earnest tale of green-winged wonder. David Lowery, a veteran of the independent film world and the director of the lyrical crime drama “Ain’t Them Bodies Saints,” inherits a far bigger film. 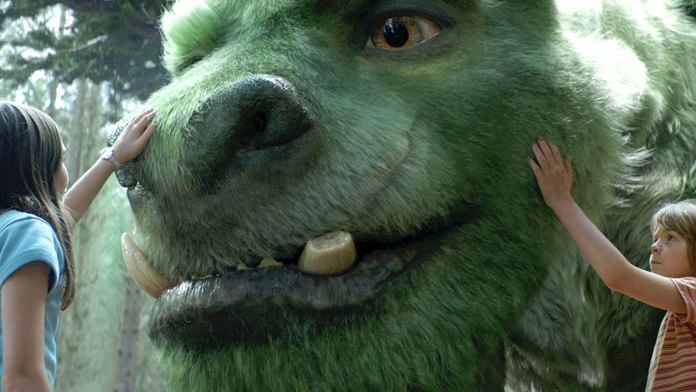 But his “Pete’s Dragon” still maintains the homespun feel of an American fable. Spielberg-light, you might call it. The film begins, in the “Bambi” tradition, in parental tragedy. Pete’s family is driving through a remote Pacific Northwest forest with Pete nestled in the backseat of the station wagon, reading a children’s book about a dog named Elliot. A deer sprints out and, in poetic slow-motion, the gravity of the car’s interior is upended. The car flips off the road and Pete staggers from the crash. Flashing forward six years, Pete (Oakes Fegley) is a wild 10-year-old orphan living in the woods alone except for his magical companion, the dragon Elliot. As far as CGI creatures go, Elliot is an irresistible one. Furry as a fairway, he’s like an enormous emerald-green puppy. Far from the “Game of Thrones” dragon variety, he’s more adept at chasing his own tail than breathing fire. Grace coaxes Pete back into society and into the fold of her family. She has a daughter, Natalie (Oona Laurence) and lumber mill-running husband Jack (Wes Bentley). It’s the push by a logging company — where Jack’s brother, Gavin (Karl Urban) is a gun-totting lumberjack — into the forest that simultaneously begins flushing out Pete and Elliot from their home in the trees. The lush forest (New Zealand, again, subbing for North America) reigns over “Pete’s Dragon,” a tale scored with soft bluegrass and exuding an environment-friendly love for the beautiful and exotic splendors of nature. When competing interests come for Elliot, they are really fighting for the soul of the forest. “Pete’s Dragon,” a Walt Disney Co. release, is rated PG by the Motion Picture Association of America for “action, peril and brief language.” Running time: 103 minutes. Three stars out of four.